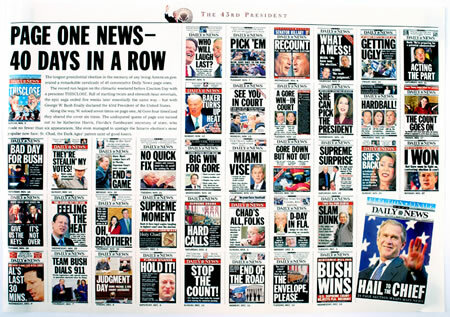 The 2000 Presidential Election is one of the best examples of the pressures a big story can apply to a news organization. For 40 straight days, the election aftermath was the Daily News' front page story, always with additional coverage inside. Each edition required dozens of photos that not only illustrated reporter's stories, but also kept the paper's visual presentation fresh for readers. Lee Clark worked the story as a Picture Editor at the New York Daily News. The Photo Desk was challenged to provide fresh and compelling images for each twist in a story that was lacking obvious visuals. Lee had to coordinate image selection for stories developed by Daily News reporters and photographers working from remote facilities from several locations in Florida, Texas and Washington DC. For stories beyond the News' capabilities, she worked with the wire services, stock agencies and photo desks through out the country.